Well I did tell I was on a roll with this vest pattern didn’t I? 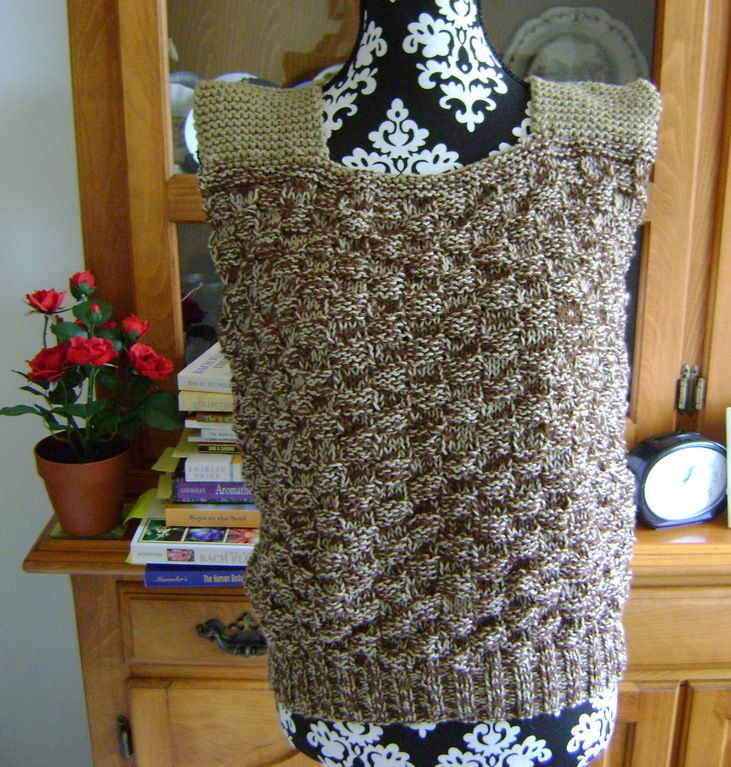 I am very pleased with my Mocha Vest as it’s been a perfect stash busting project. About a year ago I bought a huge job lot of yarn on Ebay and included in the bag was quite a few balls of 5ply yarn in a light mocha colour (Cleckheaton Machinewash 5ply Crepe), brown (Patons Bluebell 5ply), red and blue. 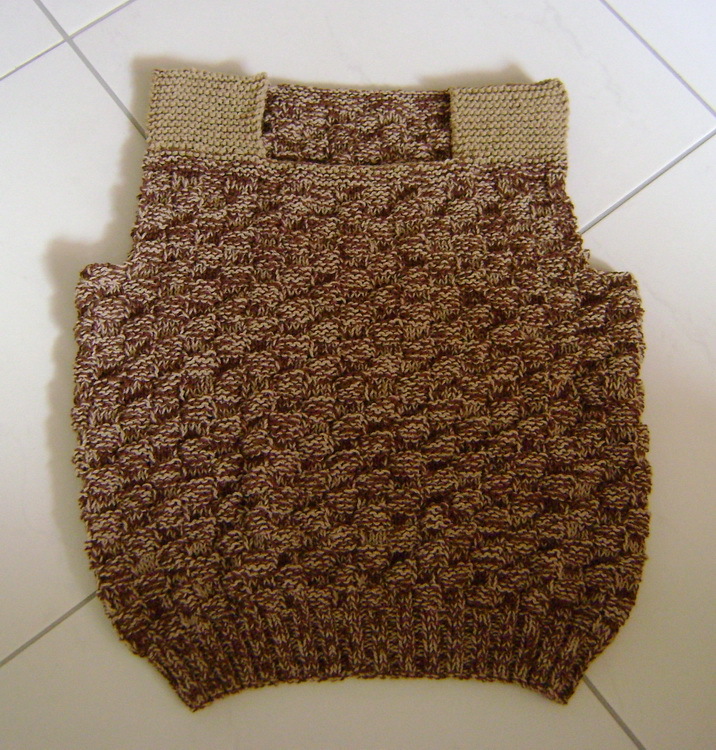 I decided to make another vest by using two strands of the 5ply yarn in the light mocha and brown. I had absolutely no idea whether I’d have enough yarn or how far I’d get into the vest before my yarn ran out. Well the knitting gods must have been looking down on me as I did run out of yarn but at precisely the correct place on the vest…the front two straps. I had also previously bought 10 balls of another 5ply yarn which just happened to be the same light mocha colour so I finished off the straps using only a half a ball of the Cleckheaton 5ply Riverina yarn. To add a bit of texture to the vest and for something different I K4, P4 and then alternated each row to give a basket weave effect. I’m really happy with the result. I wore this vest to work last week and it fits like a dream and is soooo comfy!! I’m so happy that I’m actually starting to work through my stash…..don’t worry it’ll take years to get through it all…..but at least it’s a start. At the rate I’m going, I’ll have hundreds of these vests!! 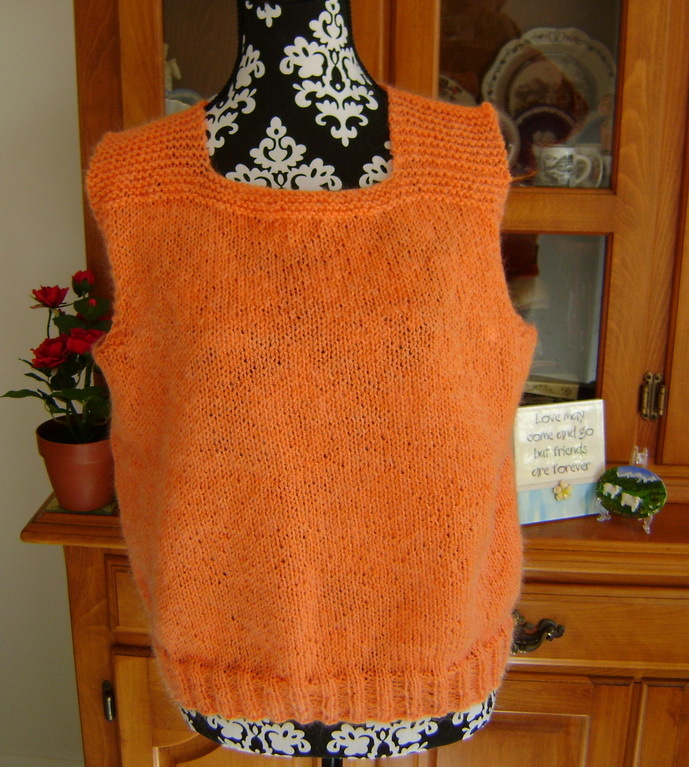 Easy Peasy Knitted Vests # 3 and # 4 and a Miniature Spinning Wheel! 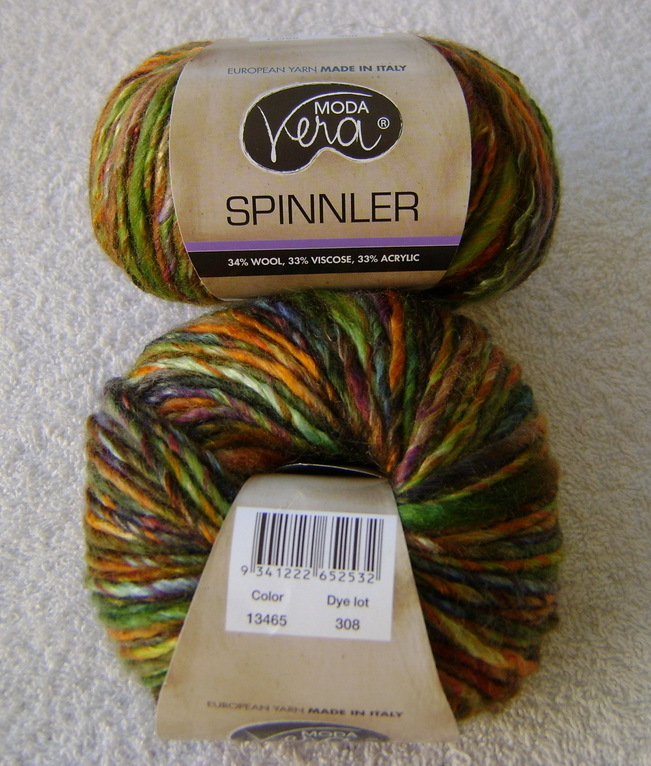 This yarn is a 45% wool / 45% acrylic / 10% mohair blend. I used size 4.5mm circular needles for the band and 6mm needles for the main body. 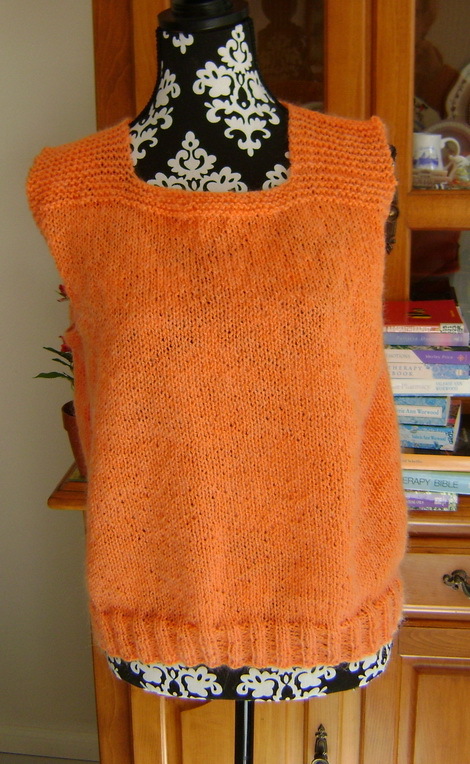 Like my other two easy peasy vests, it only took about a week to knit…..that’s just knitting at night time after work. With # 4 easy peasy vest I got a bit daring and added a cable strip for a bit of texture. I thought I had calculated it so that the cable strip would be central but alas it isn’t. However, I’m quite pleased with the effect anyway! What do you think? Sometimes a mistake in knitting can look okay! 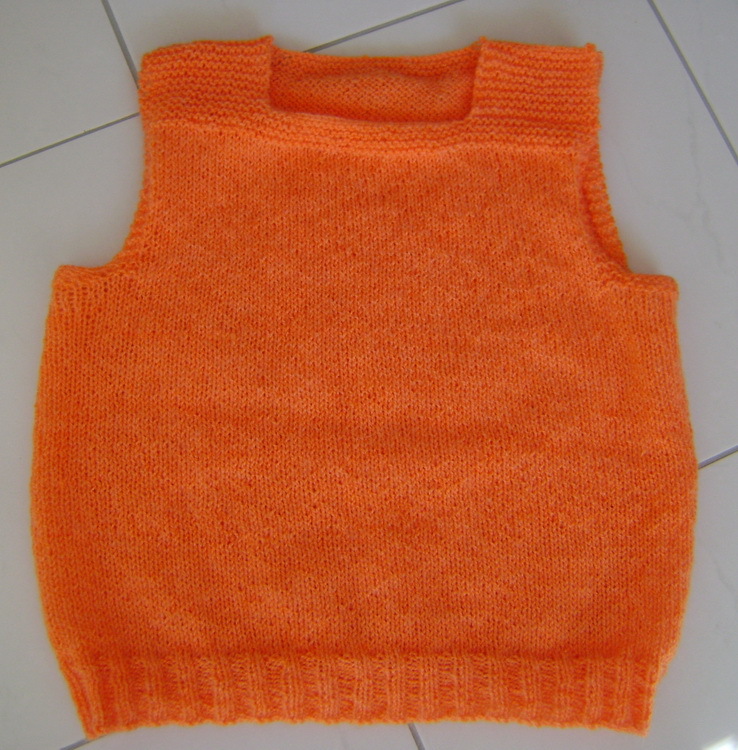 This vest is knitted in Cleckheaton Country Naturals 8ply which is a 100% wool. I used size 5mm circulars on the band and 6mm circulars on the main body. As you can see from all my easy peasy vests, I am just guessing what size needles to use with the wool and so far so good….they all fit me! I must say they are perfect for office work wear. I’ve worn them all to work every week with a long sleeved shirt and skirt and they are soooo comfortable. 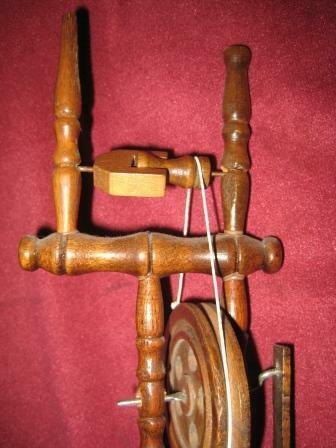 And now for something completely different, here’s a miniature spinning wheel that I picked up on Ebay recently for $15. It’s so cute….I’ve never seen anything like it before. 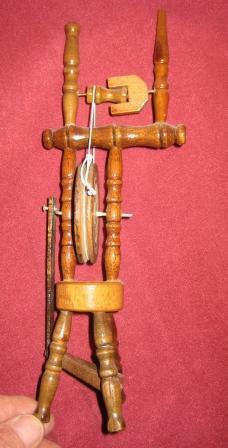 It stands only 25 cms tall and is 6 cms wide at its base. 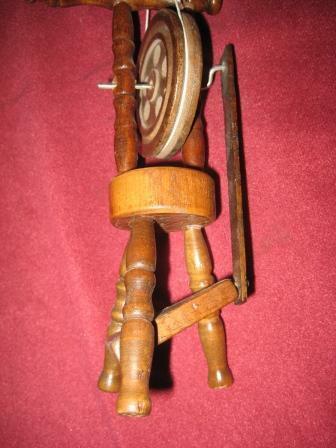 The treadle goes up and down and both the wheel and bobbin rotate. 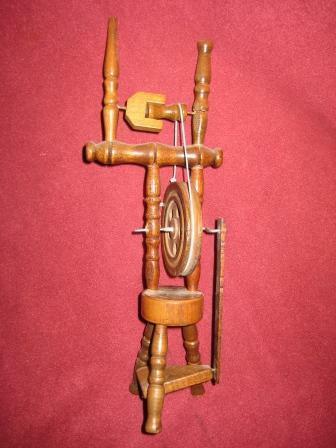 Has anyone ever seen such a tiny spinning wheel before? 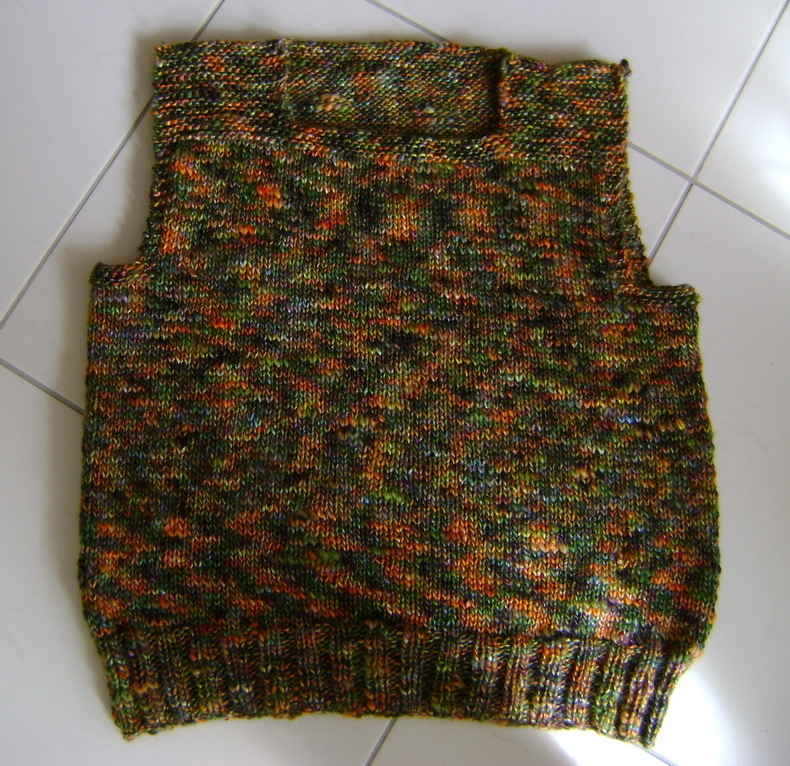 I spent the weekend finishing my 5th easy peasy vest and another cowl….I’ll blog about them very soon. I also gathered a few projects together to take on holidays with me. I’m having a relaxing two weeks at Noosavile where I’ll spend a lot of time knitting on the river bank, drinking coffee, eating, shopping, visiting markets, riding my bike (yes, I take my bike with me and cycle around a bit) and catching up with a dear friend of mine and generally recharging my batteries. I hope to publish a few posts from Noosaville to show you what I’m up to. Hope you had a fabulous weekend full of crafty and fibre goodness. 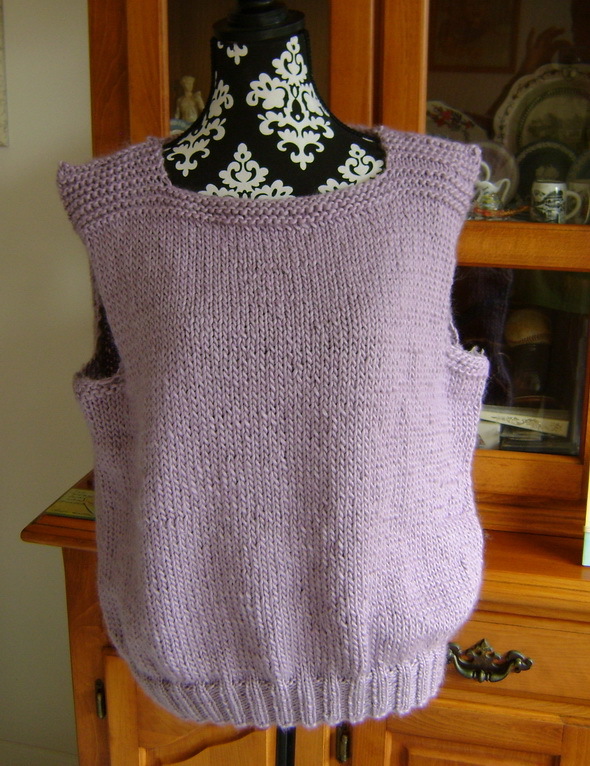 When I got back into knitting nearly two years ago one of my aims was to knit a stack of vests for winter. Here in Brisbane it doesn’t get too cold in winter so vests are ideal as they keep your chest and back warm so you only really need a long sleeved shirt underneath. Perfect for workwear in the office. I started off with good intentions and actually made a traditional vest – front, back, pick up stitches around the neck….you know what I mean. And then in July last year I started another one. I’ve finished the back and am about a third of the way through the front. Using size 4mm needles and 8ply (DK) yarn just seems to take forever!!! 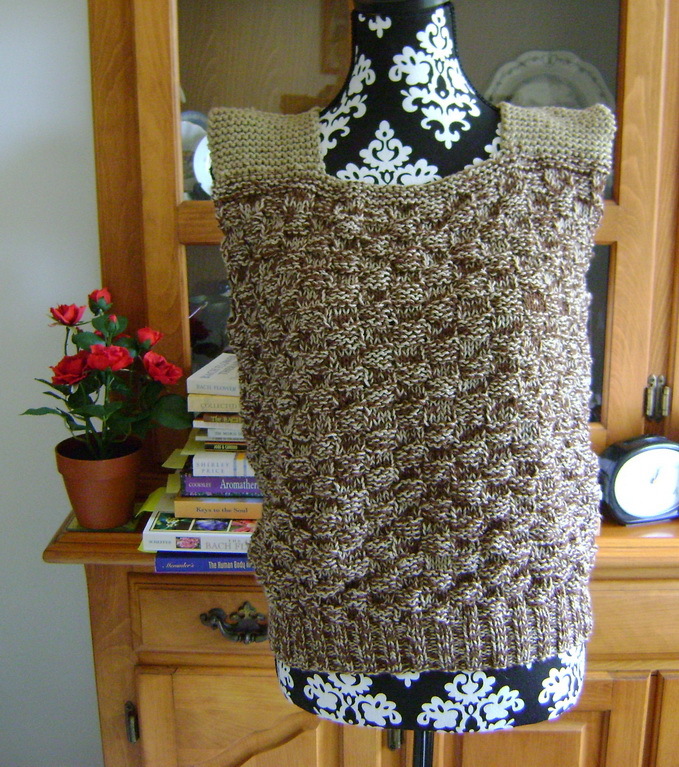 So it was with great excitement that I found the Keep Me Warm Vest on Ravelry. It’s knit in the round and doesn’t have any of that pick up stitches around the neck. Hooray!! 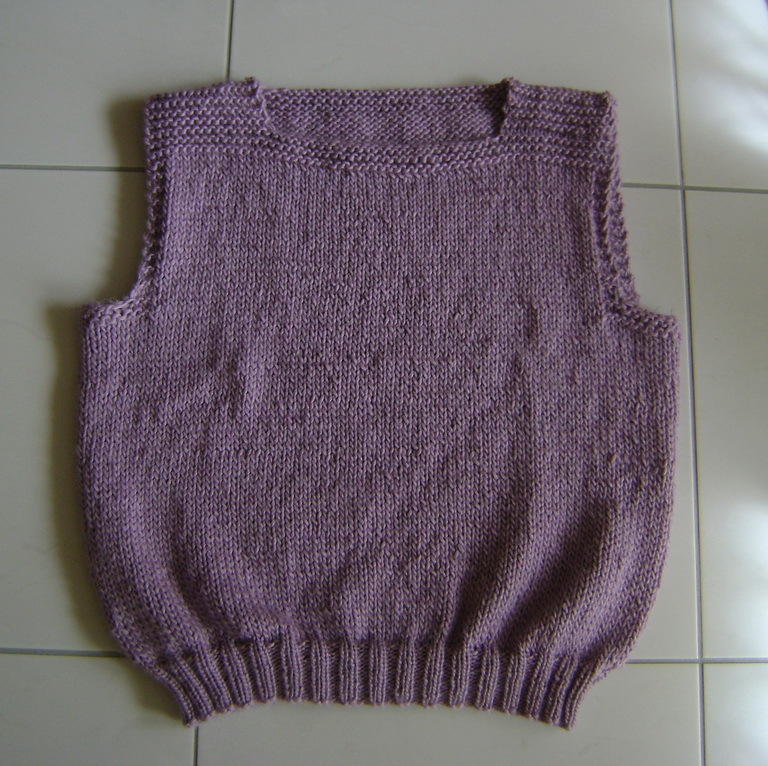 This is my first attempt….my Keep Me Warm Vest in mauve. I’ve already worn it to work a couple of times and it’s kept me as snug as a bug in a rug! The yarn I used was bought on Ebay ages ago. 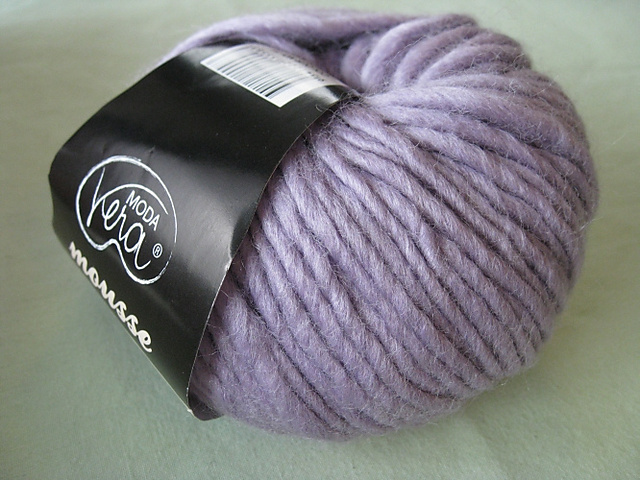 It’s Moda Vera Mousse and it’s a 12ply (bulky) 70% wool / 30% soy blend. I used 4.5mm for the band and 8mm needles for the body of the vest. I was a bit worried the 4.5mm was too small and that I was going to have trouble getting it over my head but it worked out quite well as there is a bit of stretch in the band but not enough to make it saggy. I used seven balls of yarn. 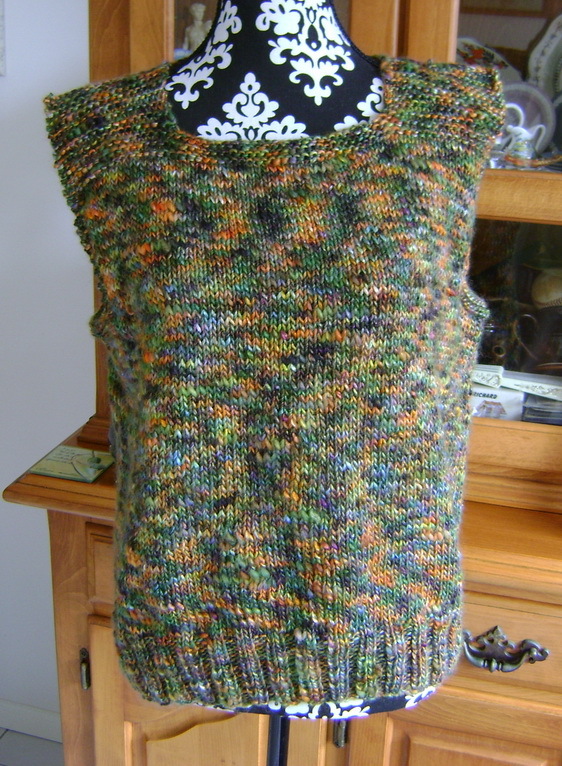 My second Keep Me Warm Vest is called Autumn as it’s knitted in Moda Vera Spinnler which is a 12ply (bulky) 34% wool / 33% rayon / 33% acrylic blend. I used seven balls of this yarn. I absolutely fell in love with this yarn when I saw the colour. All those lovely autumn shades. I featured this yarn in a previous post. Despite the fact both these yarns are listed as 12ply (bulky) the Spinnler didn’t seem as thick so I used 6mm for the band and 7mm needles for the body of the vest and cast on 150 stitches rather than 140 stitches. I have a phobia about my vests being too tight and showing every bulge so I’d rather they were a smidge loose so I have freedom of movement. And you know how much I hate knitting tension squares. So far both these vests fit perfectly. 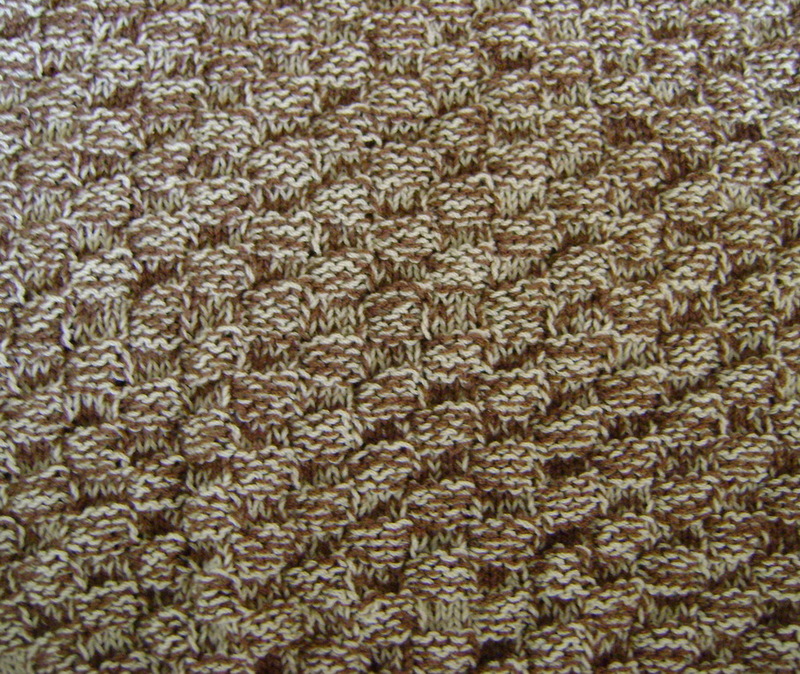 They’re not supposed to be a dense knit either. 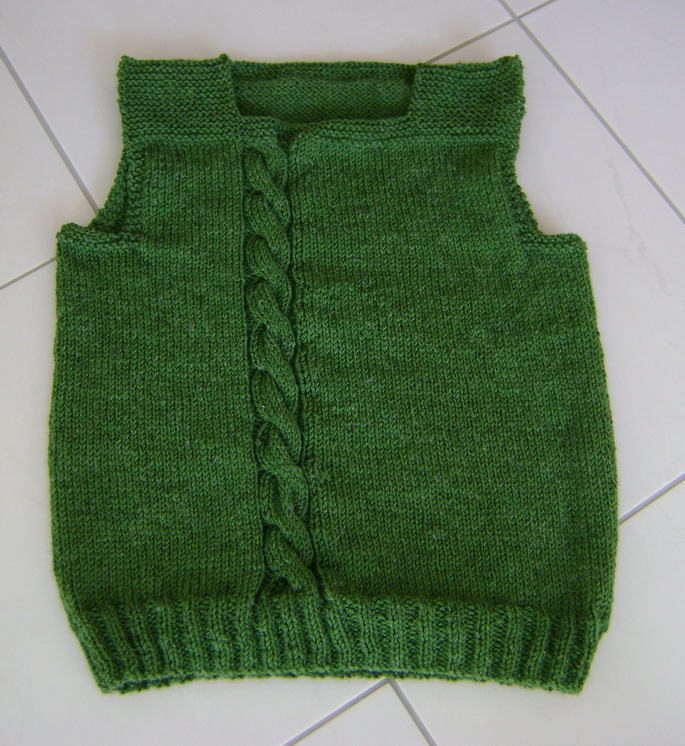 I am nearly finished my third vest which is knitted in an 8ply (DK) yarn but I have used size 6mm needles so the vest grows faster than when using the traditional 4mm needles. 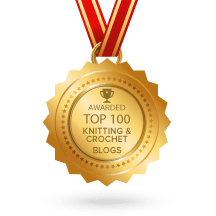 All I can say is I’d much rather spend about a week knitting a vest (which is how long it’s taken me…and that’s only knitting at night time) rather than over a year knitting a ‘properly constructed’ vest. 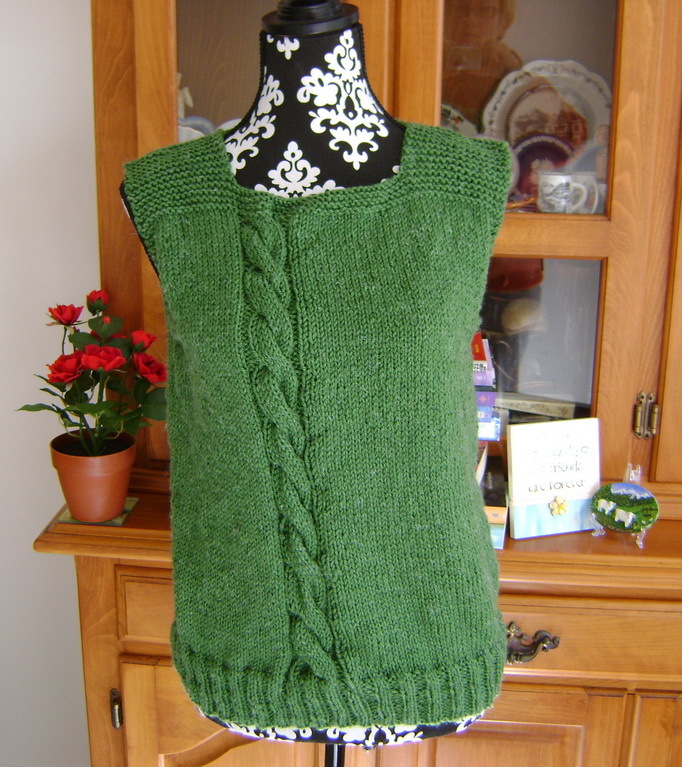 You can easily add some cabling into the front of the vest as well to jazz it up a bit. I may try that when I knit my next one in a solid colour. I am so thankful I found the Keep Me Warm Vest pattern. Let me know if you decide to knit one of these vests too.